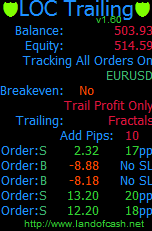 LOCTrailing is an 9 in 1 automated order stop loss trailing expert advisor (EA) with a breakeven functionality. LOCTrailing expert advisor will automatically trail stop loss of your opened positions using one of the eight trailing algorithms. Also it allows you to specify a breakeven level to automatically move the stop loss in a breakeven after a certain pips of profit. EA can be configured to track all opened orders on the pair or only those which are marked with a special comment. A quick view of the expert advisor functions. This type of EA doesn’t open orders itself. The main goal of this ea is to protect opened orders with a stoploss. It can protect all orders on the pair or only those marked with a preset comment. 1. You open an order buy or sell. 2. EA monitors it and after certain pips of profit sets the stop loss. 3. EA moves the SL value in your favor with the selected algorithm. You can protect your order with a stoploss of 1 pip after 15 pips of profit. The breakeven function is right for that. And start trail using fractals (or one of the other eight trailing stop loss methods) when profit reaches 100pips. Customizable input parameters of all indicators used. Can move SL only in profit area or instantly after an order is placed. Can set market Stop loss and Take profit instantly after an order is placed (For ECN brokers). Works on any timeframe and any pair. Works on 4 digit and 5 digit accounts. Instant download link will be provided immediately after your purchase. One Year of free upgrades and support included.